109/159 David Mumpower Just once, I would like to see a Hollywood political movie demonstrate subtlety. Just once. 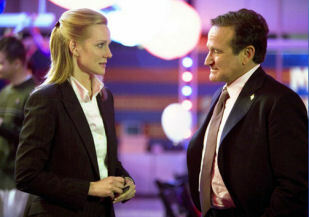 Barry Levinson and Robin Williams team up for the third time in Man of the Year, a politically themed comedy to be released in mid-October 2006. In it, Williams plays the host of a politically oriented late-night talk show who runs for president as a stunt. The problem is--he wins. The cast is impressive, with Laura Linney, Jeff Goldblum and Christopher Walken joining Williams. As in previous efforts, Levinson both wrote and directed this film. See the latest developments for this project on the Man of the Year Movie News page.